Price Reduction $115,000. Original owners have decided it is time to sell. 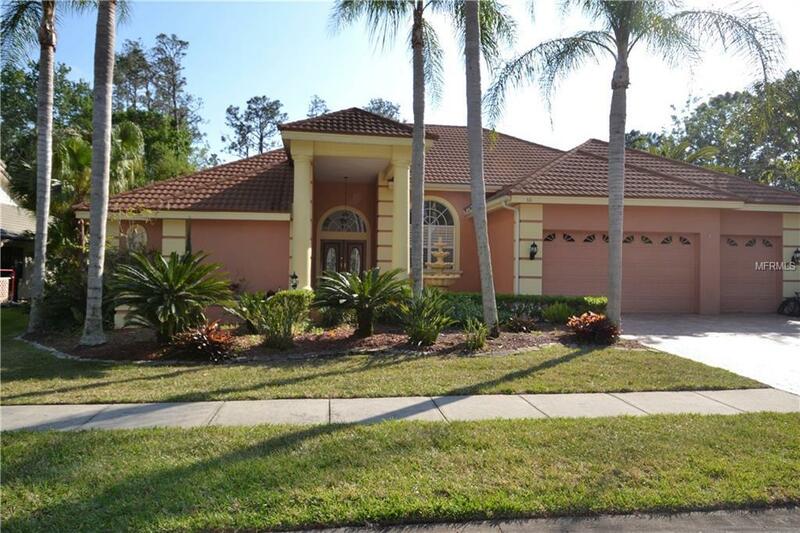 This 4 bedroom, 3 bath, 3 car attached garage in ground pool home is located within the Premier Gated Golf Club Community of East Lake Woodlands part of the Greenhaven Community. The home is situated on a 1.28 acre providing plenty of privacy. The home offers a three way split plan. Upon entering the property you will see the step down formal living room and formal dining room complete with a butler's pantry. The master bedroom is off to the left and has hardwood floors, large master bath with shower and tub along with a large walk in closet. A set of French Doors lead out to the lanai/pool area. On the other side is a large kitchen with granite counter, separate eat in kitchen area, family room complete with a wood burning fireplace and wet bar area, great for family entertainment. There are three other bedrooms and two baths. You will not see bedrooms this size (25'X13") specially designed by the current owners for added space. Out on the lanai is an in ground pool with overflow spa, solar cover and solar heating. The back yard has a private patio area and plenty of private yard space. The possibilities are endless. If you are looking for one of a kind home with plenty of space, then check out this home today and make it your own. Call today for your own private showing. Additional Lease Restrictions Hoa Approval. Verify By Calling Management And Associates 813 433 2000 Additional Parcels Yn No Association Approval Required Yn No Association Fee 380.00 Association Fee Frequency Quarterly Association Fee Includes Security Association Fee Requirement Required Available For Lease Yn Yes Cdd Yn No Community Features Deed Restrictions Dpryn Yes Flood Zone Code X500 Garage Yn Yes Homestead Yn Yes Listing Terms CashConventionalFhaVa Loan Max Pet Weight 100 Minimum Lease 8-12 Months Monthly Hoa Amount 126.67 New Construction Yn No Pet Restrictions No Aggressive Breeds. Verify By Calling Management And Associates 813 433 2000 Pet Size Extra Large (101+ Lbs.) Pets Allowed Breed RestrictionsYes Property Sub Type Single Family Residence Realtor Info Sold As-Is Senior Community Yn No Special Listing Conditions None Tax Annual Amount 6658 Tax Year 2017 Utilities Cable AvailableElectricity ConnectedPublicStreet Lights Yrs Of Owner Prior To Leasing Re No Zoning Rpd-2.5_1.